I've recently come into possession of a pair of PSB Image 6T speakers, which I'd like to refurbish and give to a friend as a gift. You can see their layout here (one tweeter, three midrange/woofers per enclosure). All 6 of the original midrange/woofer drivers have perished (either blown or rotten), and I've acquired replacements in the form of 8 ohm Jaycar 6.5" midrange/woofers. I'm also going to replace the tweeters with 4 ohm Tymphany units (drop-in replacements) unless I can find 8 ohm versions of the same. My issue is that the original crossover (originally 2500Hz) is now no longer likely to be viable, given the new driver impedances. So, replacing the drivers means replacing the crossover also. 1. I won't have time to build the crossover myself, and was thinking about either this unit, which has adjustable attenuation, or this unit which crosses at 2500Hz (which might sound better). I'm not sure which one to choose. 2. I expect that the speaker will be a 2-way setup, with one circuit for the tweeter and one circuit for the 3 midrange/woofer drivers. 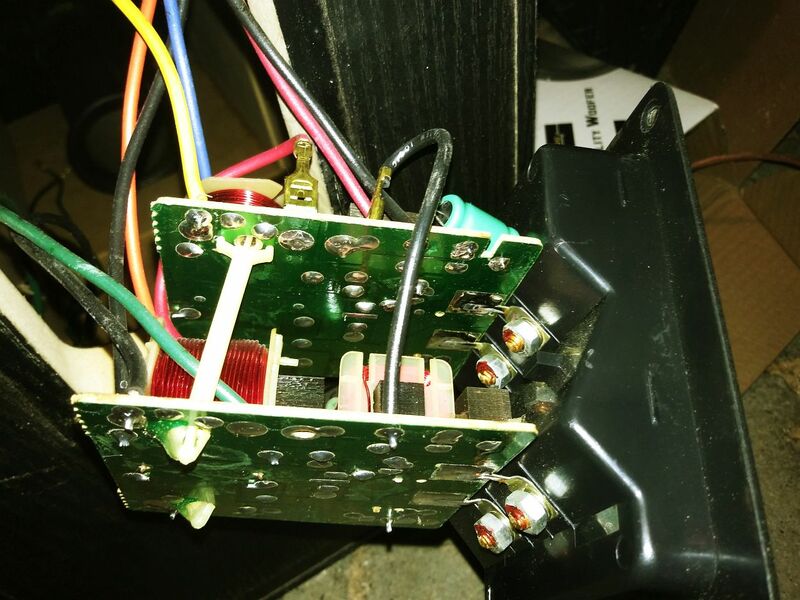 Should I connect the woofers in parallel? Or Series-parallel? As you can tell, I'm a noob. Any advice at all would be very helpful! Well, I've worked out that 3 drivers is approximately impossible to wire with a viable impedance. The only solution I can see (and none of you are going to like or recommend this) is to install a 3-way crossover, allocating two drivers to midrange (or bass) and one driver to bass (or midrange). I'm not sure of the impedance of the original drivers, though I'm pretty sure the OEM tweeter is 6 ohm. My electronics knowledge is not good enough to decipher the component layout of the original crossover, but the spec sheet notes a minimal impedance of 6 ohms. Hmm. It appears that the original crossover has two of the drivers running as the woofer, and the third running as a dedicated midrange. Running the two woofers in parallel should be fine, with a bandpass crossover on the mid you should not end up with any problems with the impedance (the original's impedance plot does look to go quite low). I think your biggest problem is going to be the box tuning, and wether it will work well with your new woofers. You may need to make adjustments to the ports. I think you can probably try the original crossover, but to get the best results you will need to design a new one (or perhaps go active with something like a mini-dsp. Cori, I think you need to take a pause and understand what you have first. Mostly stop buying parts for now. You need to understand (ie. 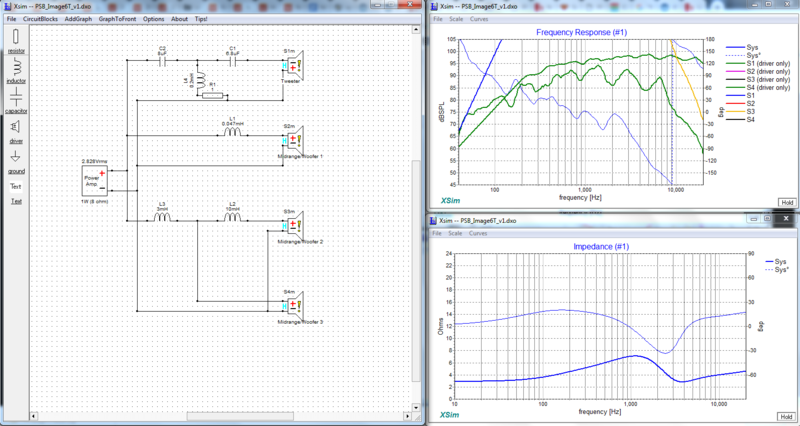 simulation model) the speaker design to see what replacement parts will work. If you supply a few crossover board photos (2 sides) and physical measurements I can build a sim model for you and check any replacement candidates. 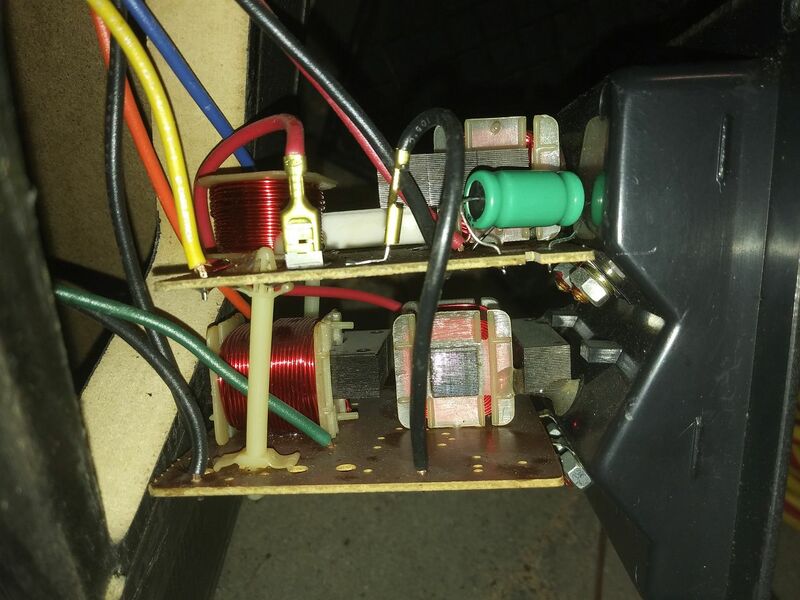 Are the old drivers electrically blown? This should be checked with a meter, there could also be a problem in the crossover or wiring? It may also tell you the DC coil resistance which will be important. Have you done a wiring diagram from the binding posts to the crossover to the drivers? Hand drawn and a photo is all that's needed. First, thanks so much indeed for your comments. They really helped point me in the right direction. Yes, I can confirm that the original drivers have either perished physically and/or don't respond to a multimeter, unfortunately! Sadly no impedance measures on either the tweeters or the drivers. Here are some photographs of the crossover. I replaced two bulging capacitors (6.8µF 100V and 8µF 100V) with new ones (6.8µF 100V and 10µF 100V). I estimate the board size to be about 7cm by 8cm. However, I really do not want to put anyone to any trouble here. Your advice has already helped me tremendously! Last edited by Cori; 11th February 2019 at 12:41 AM. Thanks for the link to the version of Image 6T that you have. There seems to be many, very different models of 6T over the years and yours appears to be circa 2000-2004 period. Just to confirm, it has 3 visually identical woofers (can you check/confirm model# on the magnet back) and 1 tweeter at the very top. Is that correct ? 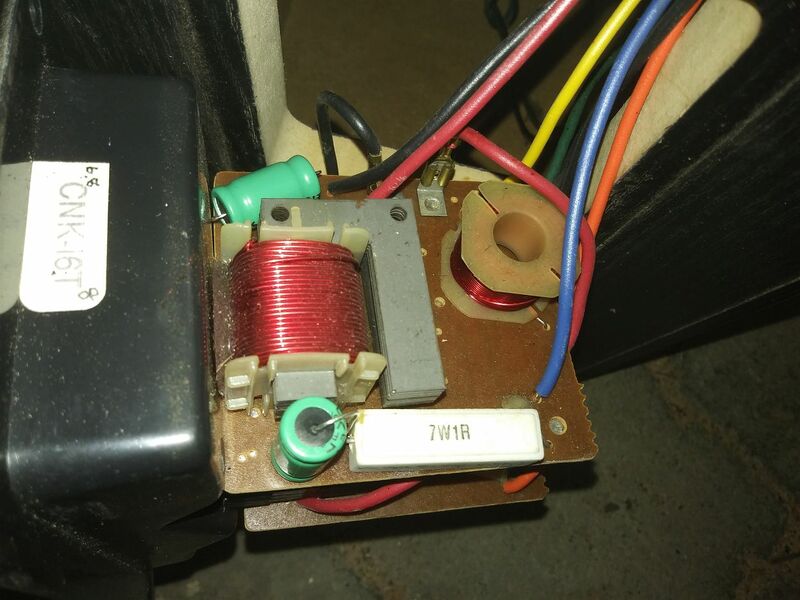 Just to confirm, all drivers are electrically open (measure resistance when they're disconnected) but be sure to mark the +ve terminal wire (with tape) so you can reconnect your new drivers in the correct polarity. Its surprising that every last driver is fried in both cabinets. It must have been a real enthusiast, not wanting the music to stop. So we know (from the photos) 2 caps values [6.8uF, 8uF] and that there are 4 inductors and 1 resistor in the XO. I'm assuming this is the only XO board in the cabinet and that there are none in the other chambers. First iteration based on what we know and lots of guesses. It's probably a 2.5way XO. I've taken a stab at a typical XO that uses those components and gives you a smooth response, bass boost and reasonable speaker impedance. I used Xsim which is easy to use if you want to install it and try it out. 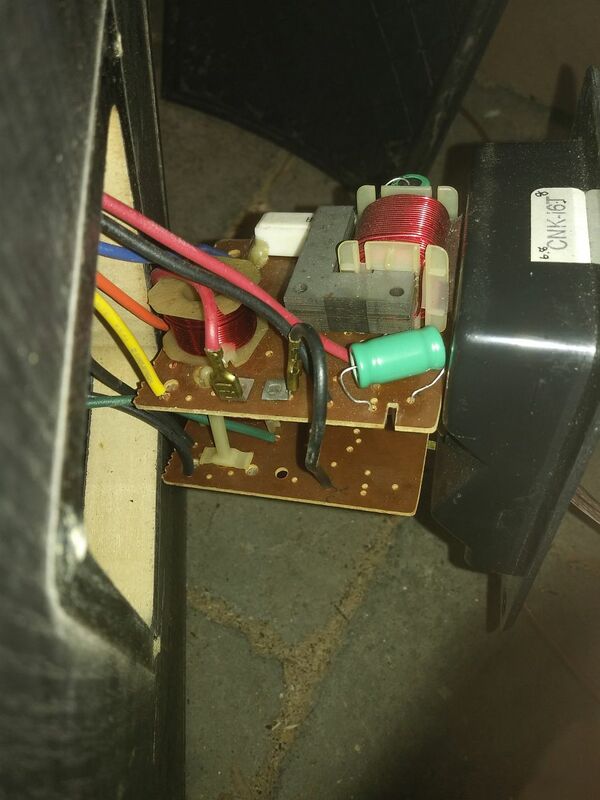 I've grouped the drivers to reflect the biamp connections on your cabinet. To refine things even furthur. I would need a clear photo (tracks visable) of the bottom of each XO board to get a proper schematic. I would also need to know which drivers those wires go to. I also need the size of each chamber (H-W-L) and the size of each port tube (D-L). The Image 6T and Image T6 are completely different models. The 6T was a 2-way (probably actually a 2.5-way) from the first Image series. Then there was the T65 which was very similar to the 6T but had metallic coating on the cones. Then later they made the T6 which is a 3-way with yellow cones. Then to make things more confusing they have a similarly named high-end "Imagine" line, and also "Imagine X" which I think is between Image an Imagine. Don, thank you so much for this careful advice. It is really helpful and I have learnt a lot. I installed XSim, and modelled the circuit as you did. I then used FPGraphTracer to convert the manufacturer frequency response images into .FRD files. I'm not sure how successful that was, as my Frequency Response curve doesn't look quite like yours (see below). As for the cabinets, they measure 98cm (h) x 20.5cm (w) x 47cm (d). There are three port tubes, and each one is 7cm in diameter, and 19.5cm deep. You're welcome. Hopefully you'll be able to make those cabinets into speakers again. This is rev 2 based on what I can get from the photos. I think this schematic is 95% correct. I can't tell if the the lower woofer inductors (L3, L4) are in series or parallel, so I put them in parallel this time. The inductor values are a guess based on what seems to work. There is a way to measure them but its not necessary at this point. The "midbass" circuit physically sits on the upper XO board but is electrically connected to the lower XO board to support biamping. The red+black wires between the 2 XO boards are for this function. 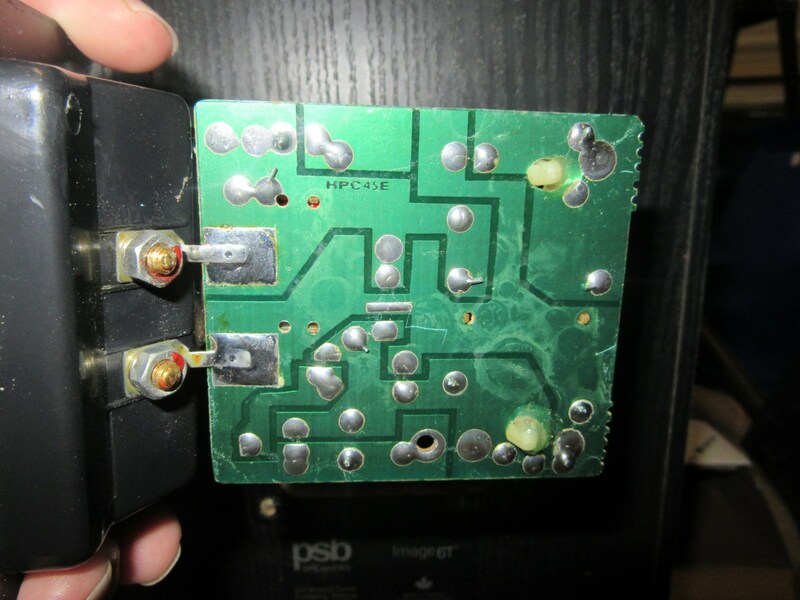 There is also a "cut" in the edge of the upper XO board to isolate upper -ve terminal from the lower -ve terminal. I used Dayton drivers [DC160-8, DC28F] in Xsim as typical 8 ohm drivers because it was easy to get data for them. You can see from the impedance graph there is a problem around 100Hz because many amps can't drive 3ohm. It suggests the original woofers were higher than 8 ohms. It's the internal chamber volumes that are important to the "tuning" of the system. The driver, the chamber volume, and port dimensions need to work as a system. The 6T has 3 ports and 3 drivers so I assumed equal volume (18L) for each based on 2cm panel thickness, your dimensions and allowing 12 cm for the tweeter section. It's possible these chambers are joined, or reduced, you would have to remove all woofers and peek inside. The screenshots are from Hornresp (another free tool) that can calculate box tuning (alignments). The driver you mentioned earlier Jaycar CW2194 does not specify enough parameters so I used the DC160 as an example. 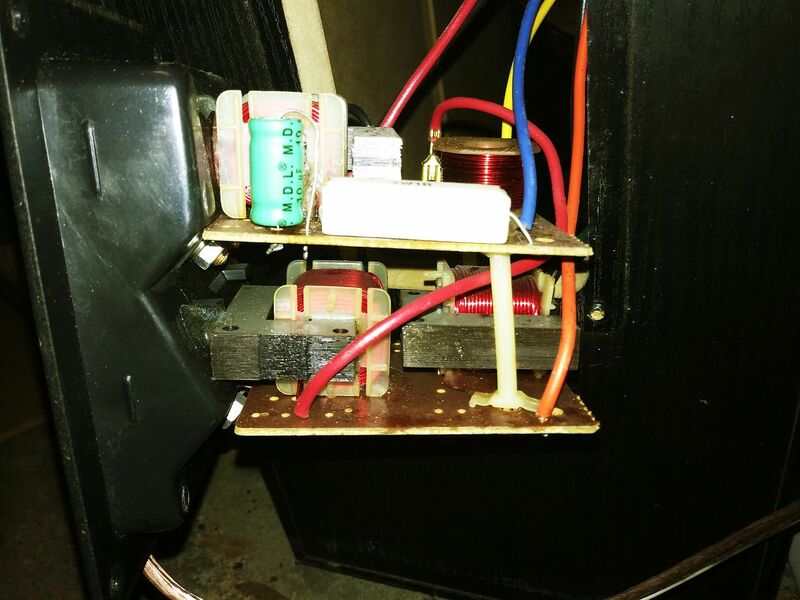 Screen capture #1 is the DC160 in your cabinet based on assumptions above. You can see its not a good fit and requires "tuning". Screenshot #2 is same box and driver but the port has been reduced to suite the driver.